The first logic executed on most computers is the BIOS. Essentially it sets up hardware specific to the system, and then passes control to a general purpose operating system. The BIOS has traditionally been closely guarded proprietary logic, though alternatives are starting to appear, like openbios used in the OLPC laptop. The BIOS logic is stored in a flash ROM chip and its settings in a small area of battery backed RAM called NVRAM, or more commonly referred to as the "CMOS". In this article I'll show how to update both from the linux operating system. It's a very common requirement to be able to update the BIOS logic to fix bugs or add new functionality, and I've needed to do this on all the systems I've worked on. Traditionally manufacturers have provided a DOS tool to update their flash ROM chips, and unfortunately this is still quite common. The obvious problem with this is obtaining DOS bootable media for the system, especially since floppy drives are thankfully a thing of the past. Dell used to support this method with the biosdisk project, and here is a more generic solution for creating DOS boot media. However this method also precludes the very useful functionality of being able to update the BIOS remotely, and is much more awkward than using the host operating system itself to do the update. Now some manufacturers are starting to provide linux tools to update their firmware, especially on servers which may have many flash ROM chips. For example IBM provide various tools to update their xseries servers, and I've used these successfully since 2003. Also Dell are starting to provide desktop and server tools, and also a live CD for flashing the BIOS. Another open source program you may find useful as a reference is uniflash. Also considering the privileged position of the BIOS in the system, it's worth noting this NIST guideline on BIOS protection guidelines for servers. Being able to change the CMOS settings remotely, can be very useful indeed. For example one could enable the BIOS to start the watchdog on boot on a number of remote machines. One could also use a little space for your own stateful settings on systems that don't have any, like netboot systems for example. This assumes of course, the BIOS leaves some space unused. As you can see in the diagram above, the NVRAM is 128 bytes on most systems. 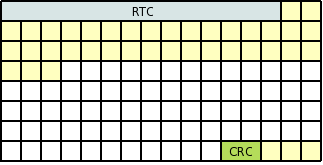 The first 14 bytes are dedicated to the RTC and the rest are usable by the firmware and made accessible to linux through the /dev/nvram device. Note you may need to sudo modprobe nvram to make this device available on your linux system, and you can confirm the driver is loaded by the presence of the /proc/driver/nvram file which represents some legacy CMOS parameters. Now the content of the 114 bytes after the RTC is specific to the system's firmware, so the general method to change it is, on one machine enter the BIOS settings menu on boot, and set parameters as required. Then when the machine is fully booted, one can copy the settings with the dd if=/dev/nvram of=nvram.saved command. If your other machines have exactly the same BIOS settings then it's trivial to copy them to the other machines with the dd of=/dev/nvram if=nvram.saved command. Using that information I was able to write a simple utility to update the thermal reboot limit BIOS setting, and run it remotely on thousands of systems. Again I must stress that while you can use this utility as a template for your own, it's not generic and you will have to determine the CRC offset etc. as described above.